Iron is a metal, defined as a chemical element with the symbol Fe. It is the most dominant by mass element on Earth. Iron is a very important biological element that forms complexes with molecular oxygen present in the blood components of hemoglobin and myoglobin. The human body has no efficient methods of iron excretion, therefore too much iron toxicity is a dominating factor and can only be effectively regulated by the uptake amounts. Some studies indicate that hemoglobin rich in iron from the red meat facilitates the development of colorectal cancer due to a possible development of hemochromatosis, although there is a strong presense of controversy. Hemochromatosis (autosomal recessive disorder) occurs with the complex of significant iron overload. The best way to supplement with iron is through the food products. 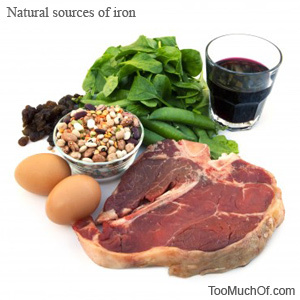 Additional supplementation may be needed if there is no access to foods that contain iron.